Homepage / Blog about Writing Tips from True Professionals / When Editing Your Paper, What Should You Focus on? When Editing Your Paper, What Should You Focus on? When editing your paper, what should you focus on? Some people mistake editing for proofreading, but they are mistaken. Professional writers will send their work to an editor, and only when the paper is perfect, will the writer calls upon a proofreader to check the very final draft. As you are editing your paper, you will notice typos and such, and you may fix them if you wish, but do not waste too much effort. The last thing you want to do is make a paragraph perfect, only to edit it out of your paper at a later date because it doesn’t fit. In this article, we answer the question “What does editing a paper mean?” and we show you how to edit your work. When editing your paper, what should you focus on? You should focus on flow, ease of reading, style, agreement, and contradiction. The symbols used when editing a paper are the same as when you are proofreading. What is Editing a Paper for Flow? Your first read-through should check your text for flow. Does it lead from one topic to another in a sensible fashion, does one point lead naturally to the next, and if it doesn’t, how do you highlight the shift from one point to the next? Do you use sub-headers to announce the next point, as this article does, or do you use transitory sentences? If you are having a hard time understanding what “Flow” is, then consider a research paper where the conclusion came right after the introduction. It wouldn’t flow correctly because you would need to read the entire thing and then jump back to the conclusion near the beginning in order to figure out what is going on. What does editing a paper mean with regards to flow? A good example of terrible flow is the movie Pulp Fiction. It is possible to edit the movie so that each scene flows in chronological order, but the theatrical version does not, it jumps from one place-and-time to another place-and-time without warning or reason. Obviously, this was done intentionally as a form of artistic expression, but a college professor may not be too pleased if you try the same technique with your coursework, (unless you are taking a creative writing course). What is Editing a Paper for Ease of Reading? Notice a lack of the word “Readability.” The word “Readability” has been perverted by things such as the Hemingway app. 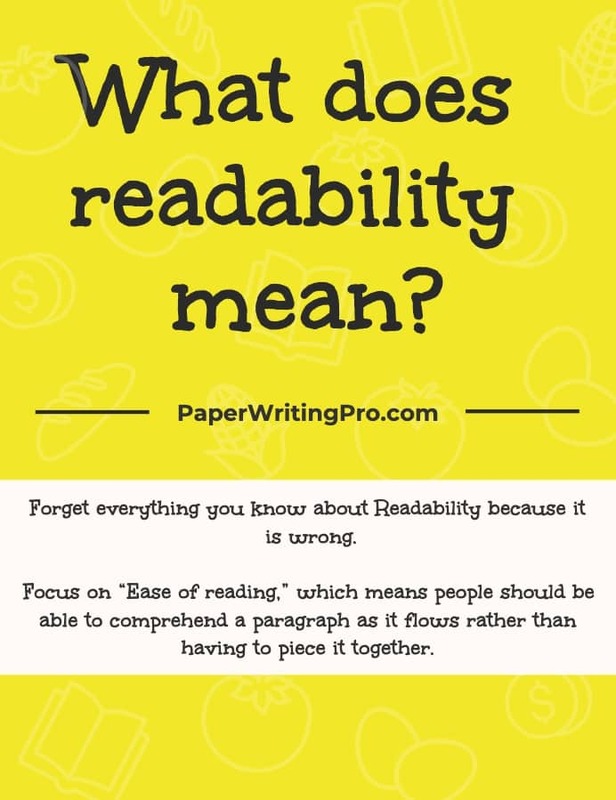 People now think that “Readability” means having shorter sentences, shorter words, and a lack of complex phrasing. Forget everything you know about Readability because it is wrong. All those readability apps do is simplify your text so that it reads and sounds childish. Before moving on to the section about agreement and contradiction, we need to call back to the example given in the previous section. Editing work is only partially about fixing errors, the rest of it is about enhancing or revealing the meaning/point/impact of the text. If you were editing the Star Wars script, you wouldn’t change Yoda’s lines into something easier to read because the way he speaks is part of the character’s style and is intentional. A bad editor will remove contextual or narrative flair and style from a piece of work. Do not remove any style or flair from the text unless your job is to sterilize a piece of text for academic use. Plus, remember that even math papers have room for style and personality and that it is normally only scientific papers that require a completely academic and clinical style. Check your text specifically for points that agree with other points. Part of the process includes defining your focus, which allies itself with checking for agreement. For example, if you are writing an argumentative paper about Euthanasia, a piece about abortion may be off-topic useless you can directly link it to Euthanasia. You should also check for contradiction. For example, your argumentative paper may claim that Euthanasia is fair in one section, and then claim it is unfair in another. As an editor, you will have to justify this contradiction or remove it. Contradictions are especially noticeable in the fictional text, and they are also harder to fix. For example, you may have a character who is very timid, but in later chapters, she takes down a dragon. This would be considered a glaring contradiction unless your text shows a character arc that took the girl from timid to triumphant. One of the reasons why so many people trust the Paper Writing Pro Service is because their editors know the difference between editing and proofreading. They will then sterilize your work useless you ask them to, and they will not make it “Hemmingway app” ready because they know you are not writing for children. Plus, all of the PaperWritingPro Service editors have an English degree and English as their first language, so they wouldn’t stoop to using crude tools or various apps. Prev How to Cite a Case Study?